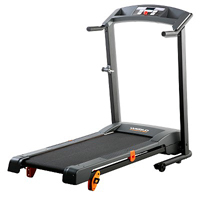 The Weslo Cadence 80 is one of the better entry level treadmills you can find in the market this 2009. But don’t get your hopes up too much because budget treadmills will always have tons of quality issues. So be prepared to have it fixed after a few months of usage. If you’re looking for a cheap treadmill that you don’t plan to use often, then you can consider buying this machine. Just be sure that you put aside some repair allowance when this machine shows signs of breakage. The Weslo Cadence 80 offers a 1.3 CHP drive motor which has enough power to reach up to 10mph. This motor is good enough for walking or light jogging. However, if you’re a runner, this is not the treadmill for you. This machine was not built to withstand the stress generated from running. The 16” x 45” running surface is too small for most people to be comfortable with but that is to be expected from a $400 treadmill. It also comes with Comfort Cell™ cushioning to protect your joints during workouts (this would benefit those who plan to jog on this machine). Like most Weslo treadmills, this model also comes with SpaceSaver® design which allows you to fold the unit up and out of the way after your workout. As mentioned above, the biggest weakness of this machine is its durability. This cheap treadmill was not built to last. It is made from low quality parts because that is the only way they could sell this machine for such a low price. I don’t recommend the Weslo Cadence 80 treadmill. There are other treadmills out there that would provide you with better value for your money (see our best buy treadmills page). If you plan on buying a Weslo Cadence 80 treadmill, I suggest you buy it at WorkoutWarehouse.com. They offer a very competitive price. You can get it for just $399.